Three-row luxury SUVs are typically some of the largest and most expensive vehicles, putting them out of reach for average car buyers. There is one exception, however: the 2019 Acura MDX. With an affordable base price, the brand-new MDX packs a ton of value into its mid-size SUV package, including some of the best standard features in its class. If you’re on the hunt for a luxury SUV with a third row in NH, Sunnyside Acura would love the opportunity to prove how the newly-redesigned MDX should be at the top of your consideration list. Because the MDX is not just one of the best value SUVs–it’s one of the best luxury SUVs as well. Below, we’ll detail the MDX’s performance, interior, and detail how it compares to its competition. We pride ourselves on providing upfront and transparent information about the Acura vehicles we sell, so you can always trust you’re getting honest content from Sunnyside Acura in Nashua, NH. Keep reading to learn more, or click the button below to view our inventory of 2019 Acura MDX in NH. Luxury vehicles are known for offering plenty of state-of-the-art features, but for a price. The 2019 MDX offers features like AcuraWatch safety, power moonroof, heated seats, and tri-zone climate control standard on all models. This goes above and beyond its competition! The 2019 MDX is one of the few mid-size luxury SUV that comes standard with third-row seating, but it also has a total of 90.9 cubic feet of cargo space. That’s 22.5 cubic feet more than the previous generation MDX! Why Choose a 2019 Acura MDX in NH? A great mix of standard features, performance, and value-based pricing all make the 2019 MDX a great choice for luxury SUV buyers. Below you’ll learn more about the new MDX to make you an expert when you visit our New Hampshire Acura dealership to test drive one! What’s New in 2019 MDX? The New MDX marks one of the most dramatic design changes made to the mid-size SUV. The biggest part of this design change comes in the updated grille, which now features an oversized Acura logo to replace the company’s classic plated grille. 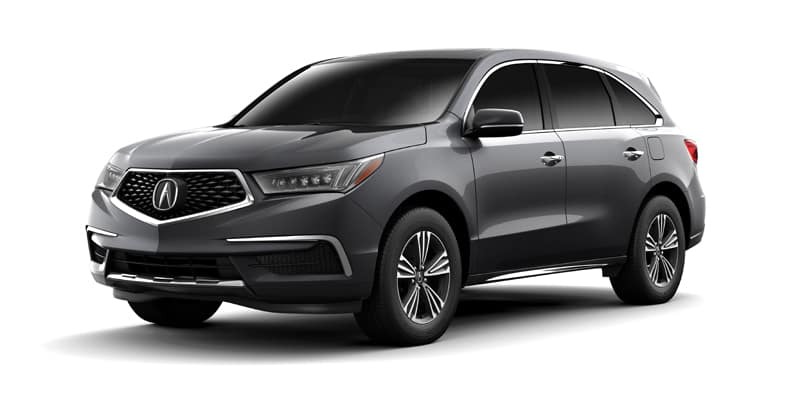 Alongside this update, the exterior of the new MDX also features a redesigned front fascia, new bumper that brings back the noticeable exhaust outlets, and chrome rocker panels. 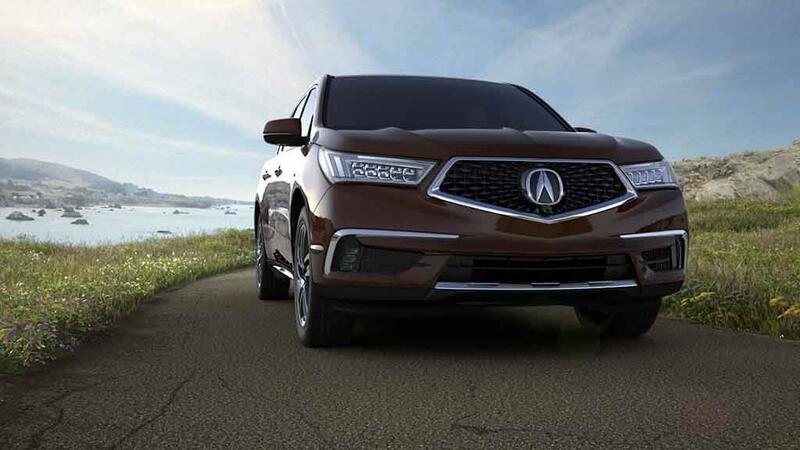 Overall, these updates work to provide a more modern feel to the MDX, while maintaining the classic design and feel that has made it one of the best-selling luxury SUVs of all time at Acura dealers in NH . On the inside, Acura has made upgrades to give the buyers even more value compared to the previous model year. One of the biggest is the addition of AcuraWatch as a standard feature. This suite of advanced safety features includes Lane Keep Assist, Adaptive Cruise Control, Road Departure Mitagation, and Collision Mitagation Braking. For the 2019 model year, Acura adds to the MDX interior in order to add more luxury options. These new features include authentic wood trim in a Desert Olive Ash color scheme, standard 4-way power lumbar adjustable front seats, updated second-row configuration available with Technology and Entertainment packages that allow easier access to third row seating, and matching wood trim for the center console on models with the Advance Package. In addition to these fantastic updates to the 2019 MDX, Acura is adding the A-SPEC sport appearance package for the new model year. Seen first on the new generation TLX and RDX, the popular option has finally come to the MDX! Featuring 20-inch shark grey aluminum wheels with low profile tires, the exterior of the MDX A-SPEC is unique thanks to its blacked-out and dark chrome trim on the headlights, grille, window surround, and tailgate. Inside, you’ll find sport seats in red and black leather with Alcantara inserts. The A-SPEC interior also features exclusive gauges with red accents that really drive home the sports car experience. The interior of the MDX was given a great upgrade to match the exterior updates. As you step inside, you’ll be greeted by the always-standard leather seats designed to be as ergonomic as possible. When equipped with the Advance Package, MDX buyers will receive upgraded perforated Milano leather seats that feature contrast stitching and piping for that extra soft and luxurious look and feel. With the Technology Package, you can upgrade your MDX to come with even more features to make your commute or family adventures that much more enjoyable. You’ll get one of the most advanced navigation systems with 3D views and HD traffic, including re-routing and even climate control linked to the GPS! 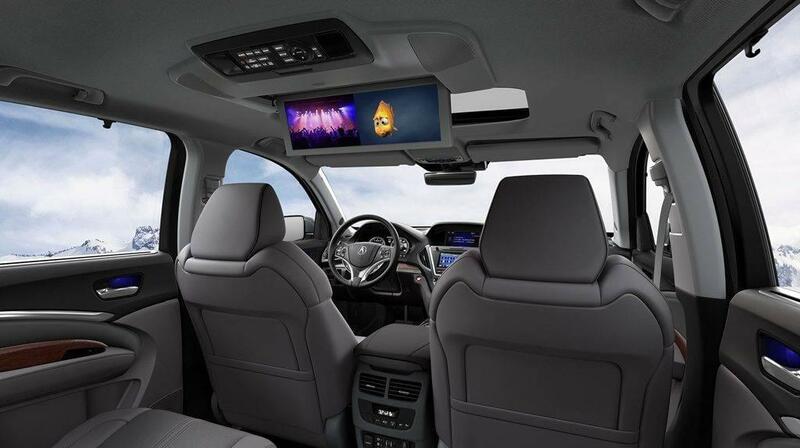 A ten-speaker audio system will immerse you in your audio with a premium system combined with an already-quiet cabin. And as New Hampshire residents, you’ll find the Technology Package upgrade worth it just to get the Remote Engine Start! As always, you can count on the MDX to have some of the best standard features amongst luxury SUVs. Some of the best include LED headlights, power moonroof, tri-zone climate control, and an 8-speaker premium audio system. These are just a small sample of what comes standard on the 2019 MDX, but it’s still leagues beyond what the competition is offering. The MDX’s two biggest rivals in New Hampshire are the Lexus RX 350 and BMW X5. While the Lexus is the closer competition price-wise, BMW is the closer when it comes to features and performance. The MDX offers more standard features compared to the Lexus RX 350, which is priced extremely similar. These include a power moonroof, AcuraWatch safety suite, memory mirrors and memory driver seat, tri-zone climate control, heated leather seats, and the third-row seating. The BMW X5 does offer a standard dual-panel moonroof and standard navigation system, as well as a high-performance 300-hp turbocharged engine, however; the MDX is priced well below the X5 when comparing AWD models. Unlike the X5, the MDX does not require an upgrade for third-row seating. It comes standard. The MDX features a total 90.9 cubic feet of cargo space, compared to the Lexus RX 350’s 56.3 cubic feet and the BMW X5’s 66 cubic feet. Overall, there’s no denying that the BMW provides the best performance of the three. There’s no denying that the Lexus is the most affordable of the three. But there’s also no denying that the Acura MDX is the best value of the three as well. The 2019 Acura MDX is a vehicle that New Hampshire SUV buyers must pursue at Sunnyside Acura. The balance of performance and fuel economy, number of standard features, and incredible upgrades only tell part of the story of this luxury SUV. You owe it to yourself to get behind the wheel of a brand-new Acura MDX by test driving one at our New Hampshire Acura dealership. Not only does Sunnyside Acura always keep up a great variety of new MDX inventory, but our salespeople are Acura experts who are trained to educate buyers instead of purely sell cars.Our approach to the car-buying process, as well as our world-class customer service, is what makes us one a great choice for Acura car buyers throughout New England. Contact us now or click the button below to view our current MDX inventory to find your perfect match today!